Peter Paul Montgomery born January 19, 1982) is an American politician, serving since 2012 as the 32nd mayor of South Bend, Indiana. He is also a lieutenant in the United States Navy Reserve. 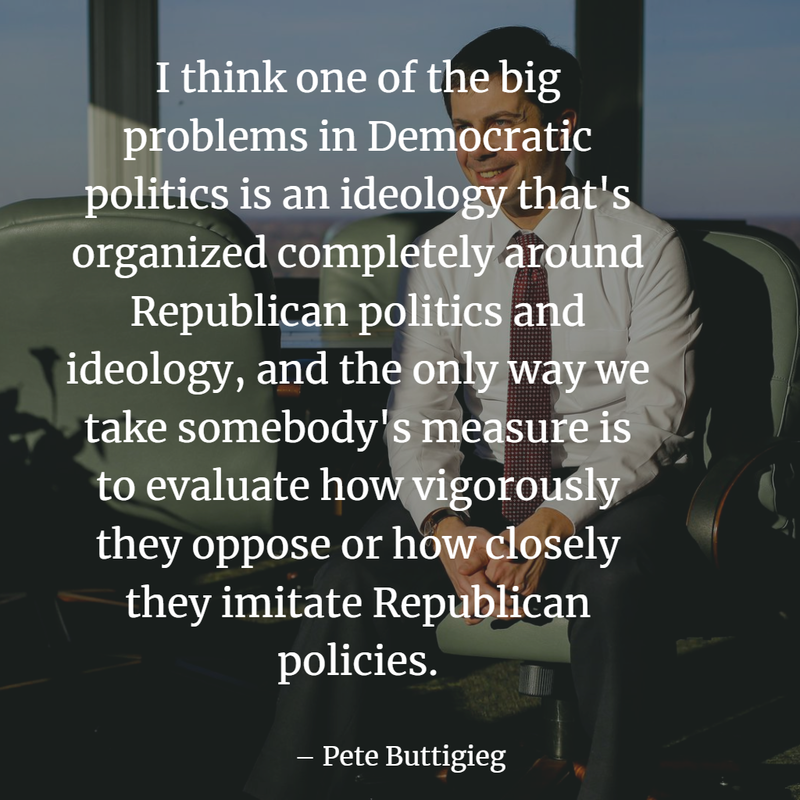 He was a consultant at McKinsey and Company, a management strategy consulting firm, from 2007 through 2010. 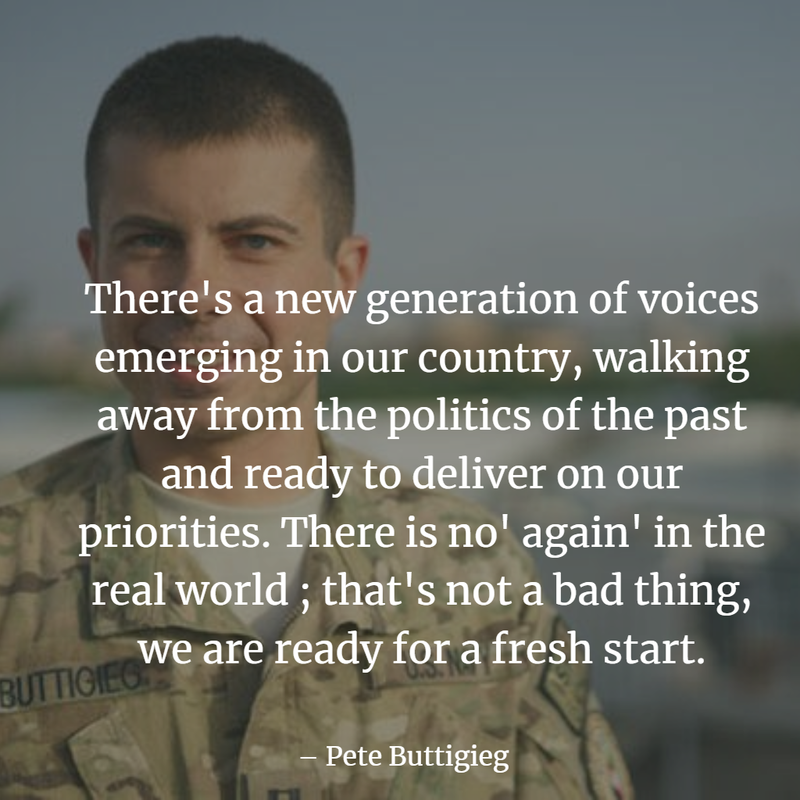 A member of the Democratic Party, Buttigieg is a graduate of Harvard University, a Rhodes Scholar, and a veteran of the War in Afghanistan. 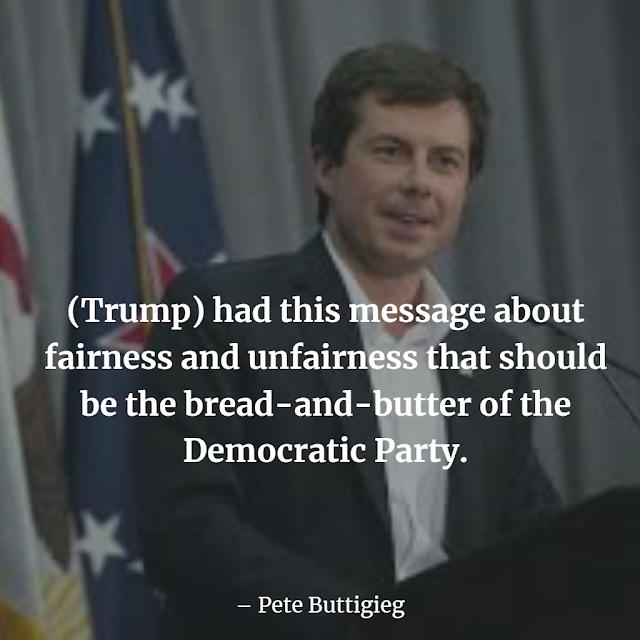 He is competing for the party's nomination in the 2020 presidential election and is the first openly gay Democratic candidate ever to run for President of the United States. If elected, he would be the first openly gay president as well as the youngest. Some people my age are seduced by this libertarian idea of having very little of anything by way of a role for government. I found that in my personal experience, freedom is secured by the good government just as it’s threatened by the bad government. There's something happening right now, that calls for something completely different than what we've been seeing. 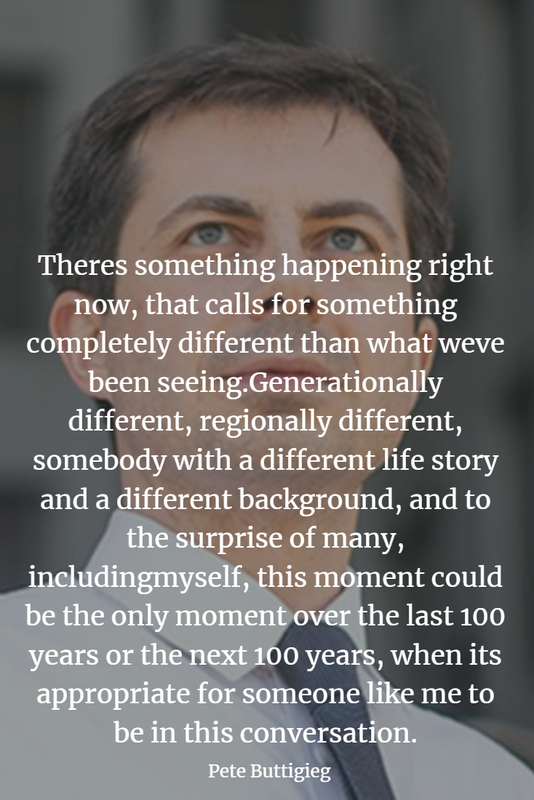 Generationally different, regionally different, somebody with a different life story and a different background, and to the surprise of many, including myself, this moment could be the only moment over the last 100 years or the next 100 years when it's appropriate for someone like me to be in this conversation. I think there will be a role for the private sector, but a very different one than what we have in the corporate system today. 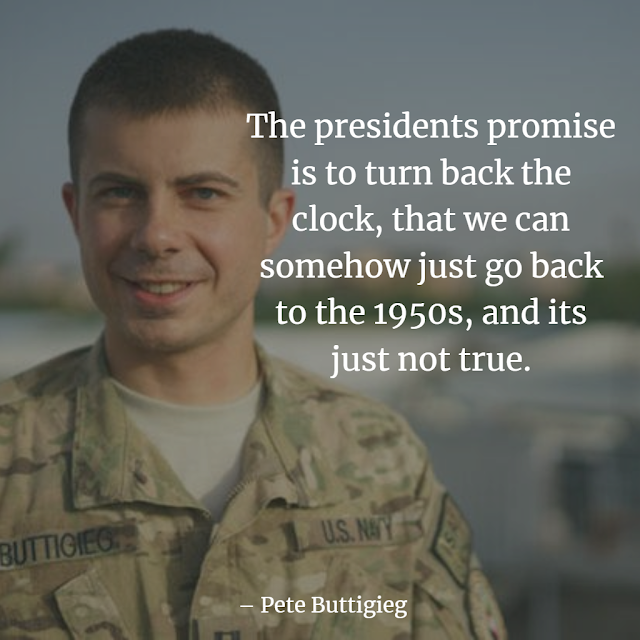 The president's promise is to turn back the clock, that we can somehow just go back to the 1950s, and its just not true. My understanding of scripture is that it's about protecting the stranger and the prisoner and the poor person and that idea, that's what I get in the gospel when I'm at church and his has a lot more to do with sexuality ... and a certain view of rectitude. 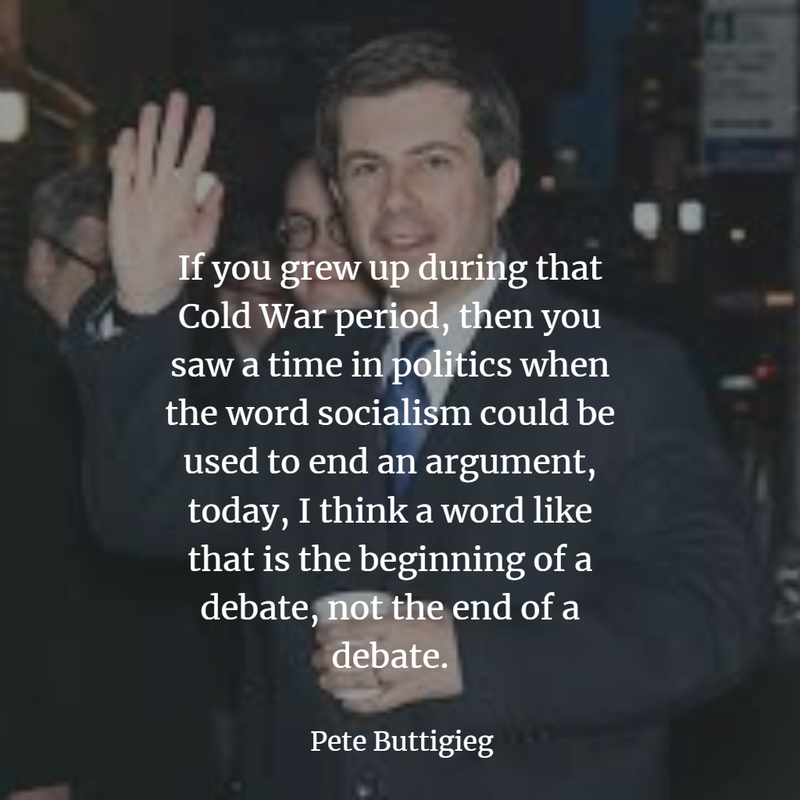 If you grew up during that Cold War period, then you saw a time in politics when the word socialism could be used to end an argument, today, I think a word like that is the beginning of a debate, not the end of a debate. I think it's the right beginning. 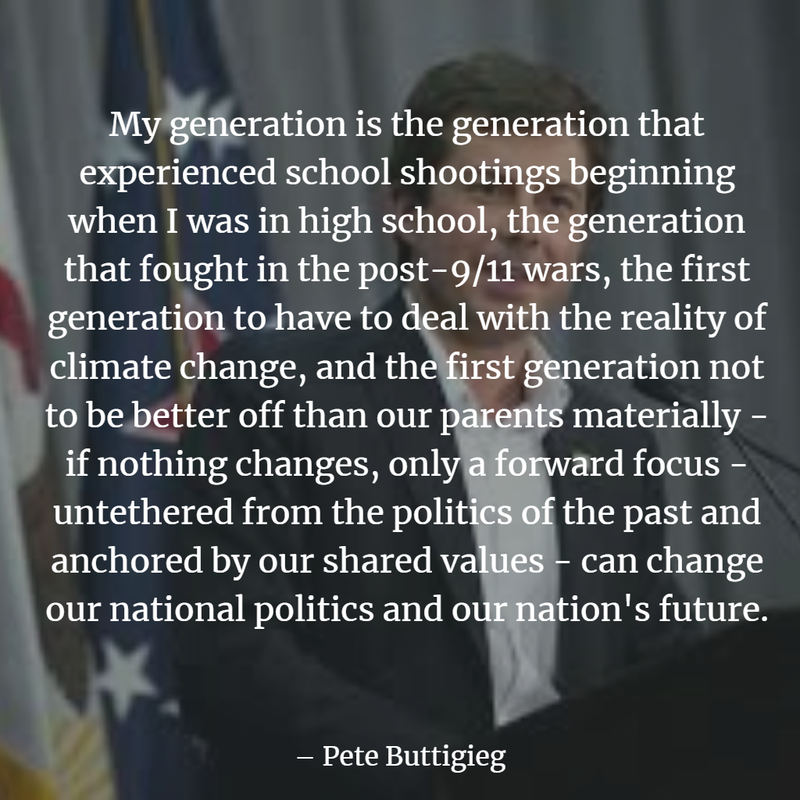 My generation is the generation that experienced school shootings beginning when I was in high school, the generation that fought in the post-9/11 wars, the first generation to have to deal with the reality of climate change, and the first generation not to be better off than our parents materially - if nothing changes, only a forward focus - untethered from the politics of the past and anchored by our shared values - can change our national politics and our nation's future. There's a new generation of voices emerging in our country, walking away from the politics of the past and ready to deliver on our priorities. There is no' again' in the real world ; that's not a bad thing, we are ready for a fresh start. 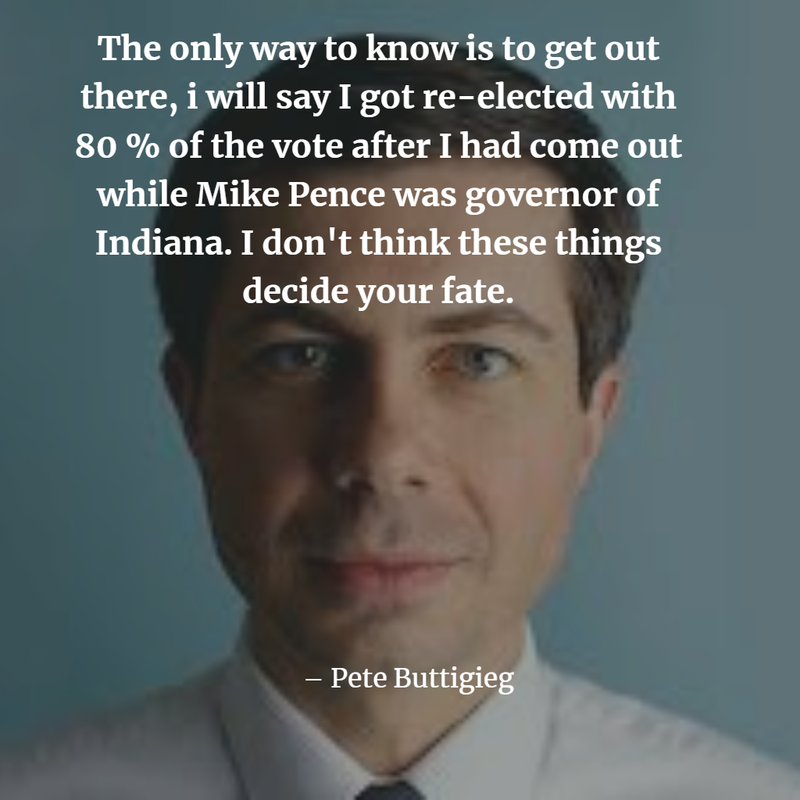 The only way to know is to get out there, i will say I got re-elected with 80 % of the vote after I had come out while Mike Pence was governor of Indiana. I don't think these things decide your fate. 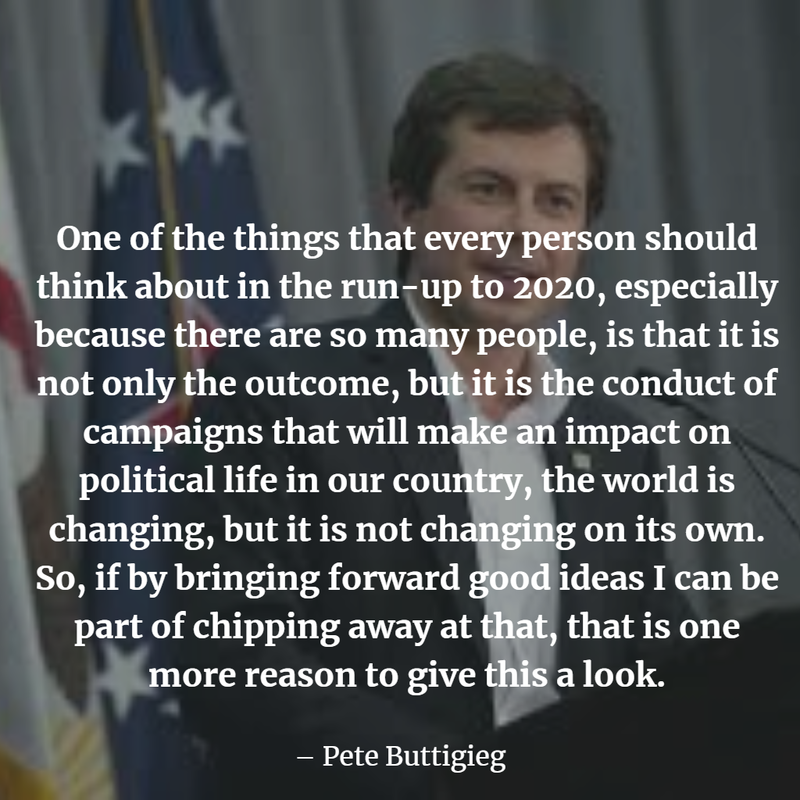 One of the things that every person should think about in the run-up to 2020, especially because there are so many people, is that it is not only the outcome, but it is the conduct of campaigns that will make an impact on political life in our country, the world is changing, but it is not changing on its own. So, if by bringing forward good ideas I can be part of chipping away at that, that is one more reason to give this a look. I think any candidate that is not already very famous probably needs to make some kind of move in January. Barack Obama came in 2016 to collect credit for the unemployment rate going from 20 % to 4 %. And now President Donald Trump wants to come to collect credit for it going from 4 % to 3 %. I think one of the big problems in Democratic politics is an ideology that's organized completely around Republican politics and ideology, and the only way we take somebody's measure is to evaluate how vigorously they oppose or how closely they imitate Republican policies. 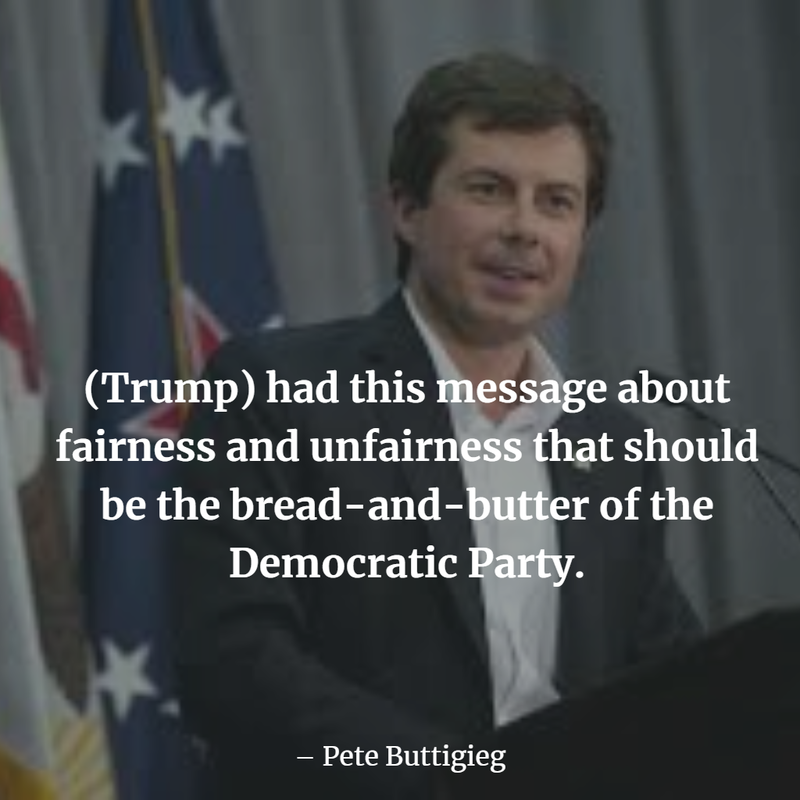 (Trump) had this message about fairness and unfairness that should be the bread-and-butter of the Democratic Party. The DNC is always vulnerable to this gravitational force that makes it treat the presidency like it's the only office that matters. My hope is that (Perez) will direct the party toward working from the bottom up. 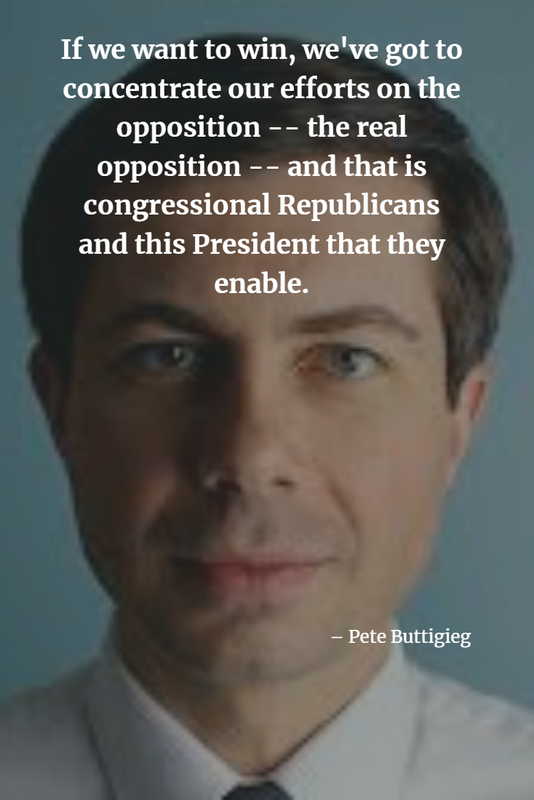 If we want to win, we've got to concentrate our efforts on the opposition -- the real opposition -- and that is congressional Republicans and this President that they enable.